Paramount has restored the legendary Best Picture winner for a one-day engagement. 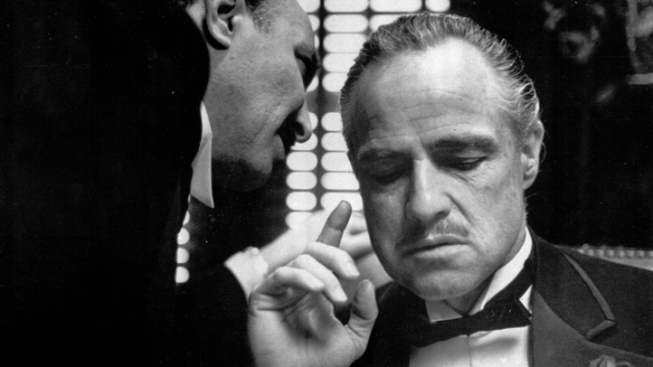 Paramount Pictures and Cinemark theater chain plan to make you an offer you can't refuse with a "Godfather" re-release. A restored version of Francis Ford Coppola's Oscar-winning Mafia saga "The Godfather" is returning to theaters for a one-day engagement March 1 in an exclusive cooperation between Paramount Pictures and the Cinemark theater chain, according to the Hollywood Reporter. The iconic American classic — which was released in 1972 to massive critical acclaim and record-breaking box-office returns — will screen in 55 Cinemark XD auditoriums across the country on March 1. The blink-and-you'll-miss-it "Godfather" re-release comes just one month before another legendary Oscar-winner, James Cameron's 1997 box-office smash "Titanic," returns to theaters in digitally-remastered 3D on April 6 to commemorate the 100th anniversary of the real-life liner's maiden voyage (and the 100th birthday of Paramount Pictures, which co-produced the film with 20th Century Fox). As Web-based video streaming services like Netflix, Hulu and Amazon Plus — not to mention the perniciousness of illegal file-sharing — continue to threaten Hollywood's theatrical distribution model, high-profile re-releases have been a reliable (if artistically unadventurous) cash cow for an industry in transition. A September 2011 3D re-release of Disney's widely-beloved "The Lion King" grossed $94,242,001 in North America and earned $74,300,000 internationally, according to figures from Box Office Mojo. The February 2012 3D re-release of George Lucas' "Star Wars Episode I: The Phantom Menace" pushed the film's worldwide total to a staggering $1 billion. Although the upcoming "Godfather" re-release is not arriving in 3D, Paramount's painstaking restoration — including a 5.1 digital surround sound remaster — may have a similar appeal to film buffs. As the Hollywood Reporter noted, the restoration was overseen by archivist Robert Harris and Gordon Willis, the film's original cinematographer, in honor of the film's 40th anniversary. Harris has previously restored and reconstructed Hollywood classics like "Lawrence of Arabia," "Spartacus," "My Fair Lady," and Alfred Hitchcock's "Vertigo." New York-born Willis' credits include all three installments in the "Godfather" trilogy and the Woody Allen favorites "Annie Hall" and "Manhattan." Paramount and Cinemark also plan to screen "The Godfather Part II" on April 19. The theater chain has made a comprehensive list of participating locations available.